Choosing for the best miter saw is essential to have the best performance, accurate cuts and the quality of output necessary to complete a certain task or job. And with many models and kinds available in the market, it is equally difficult to single out the best one that can do the job you will require. This guide aims to guide and help you make that important decision and eventually, choose the right miter saw for your needs. Achieving precise cuts to finish a wood project can be a difficult task if you don’t have the proper power tool that is capable of doing it excellently. And it is definitely not an option to leave it inaccurate as it will ruin the total look and final result of the project. Since I cannot settle for anything less than perfect, I know I would need the best miter saw to complete the job for me. Having found the miter saw that fits my need has saved me a lot of time and effort getting the precise cuts and bevel angles. And with the features that come with it, the best miter saw definitely makes a useful addition to my woodworking arsenal. Hitachi being known worldwide to be the leader in power tool research and development and has pioneered innovative technologies created this miter saw to provide a highest quality standard of performance and flexibility to provide you with smooth and precise cuts even with hardest and toughest material in any projects or tasks. Also tailor-made for your convenience, it is designed with an elastomer grip handle, large extended flip fence, easy to use and quick miter adjustments, thumb- operated positive stops and a dust bag. 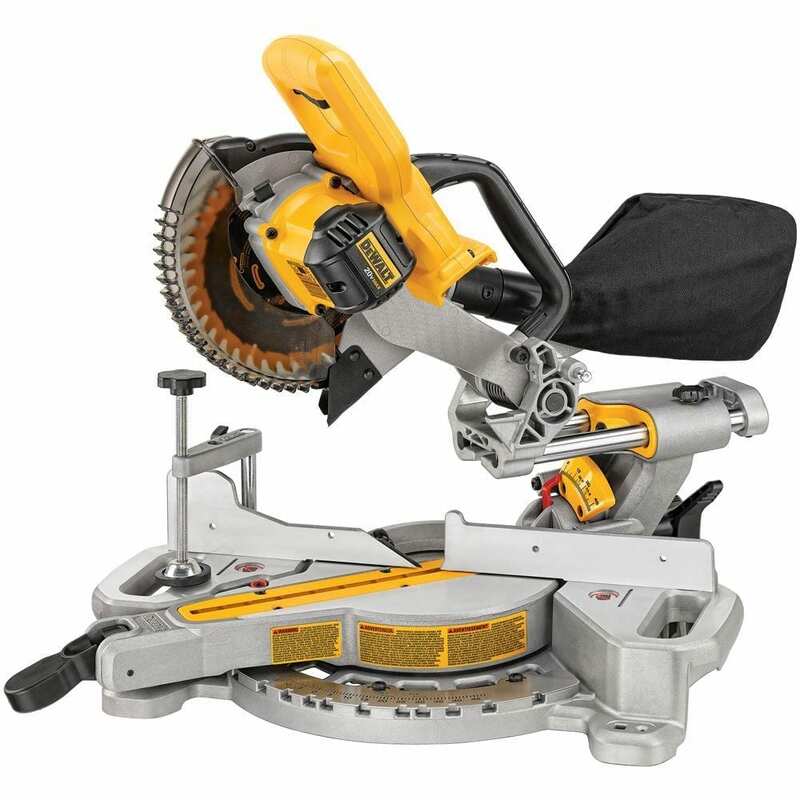 Powered by a 15-amp motor and speed of 4,000 RPM, this miter saw from Dewalt will give you smooth and accurate cuts and will make quick work of cutting, framing, crosscutting and other miter-cutting jobs. With its features, it is designed to give you versatile setup and accuracy to handle different kinds of applications. For your convenience, it is built to be lightweight and comes with a built-in carry handle so it will be easy for you to carry and move it around your workplace. 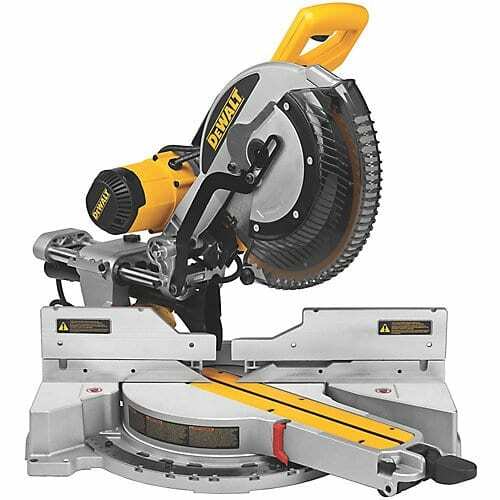 Dewalt DWS780 12-Inch Double Bevel Sliding Compound Miter Saw is described to be a walk in the line between rugged durability and fine precision that is necessary for professionals for any tasks or jobs whether requiring easy or heavy duty applications. It offers a new precise miter system machined base fence support for an increased accuracy. A new XPS cross-cut alignment system that features an improved ultra-bright LED light is designed for this miter saw that will provide you a clear vision of the cutline area and work space to help achieve these precise cuts. Miter saws can be a useful tool for anyone who is interested and into any kind of woodworks be it done professionally or only for home use. Its ability to make different soft cuts and be applicable in any materials makes it a versatile power tool that is an essential addition to any woodworkers, carpenters and home woodworking arsenal. Though it is mostly and commonly used on job sites and in a professional setting because it is built with high power motor and features that can carry heavy-duty jobs and work even on tough materials, it can be a handy tool for any different DIY projects or fix furniture or any wood works at home. Some models are specially engineered to use in job sites, hence heavyweight and made of solid construction and durable frames but there are also some that are tailored to be convenient and comfortable to use by non-professionals and beginners. Most of these miter saws are made not only to give you powerful performance and features and provide you with productive and accurate outputs but thoughtfully designed to provide its users with utmost comfort and ease when using it. Additional features that your old model may not have are now available as most manufacturers are constantly innovating and updating the components of these miter saws to be more user-friendly, improve on performance and output and be more versatile and efficient to use. 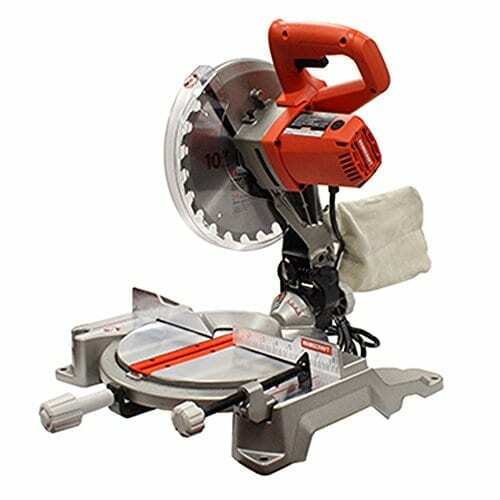 So if you find yourself working on a specific project that requires smooth and accurate woodcuts on either the toughest or most delicate materials, then this miter saw can take care of that job for you. One thing to consider before buying a miter saw is the type or classification that will best suit the needs of your project and will be convenient for you in the long run. You can choose whether you would like the single bevel, compound or sliding miter saw. At the same time, you have the option of using either the cordless or corded, as well. Each has its own benefits and limitations thus people may have different preferences because that’s the miter saw that can cater to their needs and hits their criteria. Best miter saw has the feature of providing you the best precise cuts for any sizes and in any kinds of material. It is designed to cut any range and degrees of bevel angles that is needed for any specific project. There are kinds of miter saw that is capable of even tilting the blade in different directions so you will have the most accurate angles and cuts. It is built with high power and capacity to be used in any wood applications and projects be it a home DIY use or tough and complicated work in any job sites and other professional settings. It is designed for speed, power and with its other components, makes it a power tool that can complete and finish the job in a timely manner, hence increasing your productivity and output. And with this, you are not only saving time but also your energy and money. Before you settle to one particular miter saw, however, consider these following factors to bear in mind when choosing. Since there are many kinds, not to mention brands and models of the miter saw, you have to first assess yourself and think about where and what you will need it for. This is important so you will know which particular feature and characteristic you are going to focus on when checking on the different kinds of miter saw. Though all have the same main uses, each, however, differs on the capacity and feature, thus knowing about what your project will require is essential in the decision-making process. It is important to also take into consideration the sizes of cuts that you will need for your project because each miter saw has specifications about the ranges of angles and sizes they can cut. So make sure the cuts that you will need fits the certain limitations of your choice. Before buying a miter saw, most likely you already have the picture and plan of the project all figured out, hence you already know the type of materials you will be using. Bear this information in mind while picking for the right miter saw because if you will be dealing with tough materials, wood, metals or others, you know you will be needing one that has higher capacity and power, which can typically be expensive than the others. This is also one way to get your money’s worth as you don’t want to be caught spending too much on a miter saw that you cannot maximize its use. Personally, before I buy something in general, I would always think about the long-term use of the product. Normally, I would prefer one that is versatile to use as I know this will not be the first and the last time that I will be using it, hence I would also think whether it can be used to my other future projects as well given its features and limitations. Miter saw is definitely one powerful tool that can do a lot of jobs for you. When choosing, consider one that can be used for a long time, hence has a sturdy construction that can withstand the tough works and daily use. For me, it is important to check other features and advantages of a miter saw that could give you the convenience and ease of use. To increase our productivity and efficiency, we should also be comfortable using the miter saw, as it would definitely be difficult to finish a project when you cannot even work properly with the tool. You have to consider also these factors as to whether you will be using it frequently, your storage space, easy to operate, lightweight and other possibly minor details, but essential nevertheless. Ideal for works that require precision, versatility, and reliability, this 10-inch Hitachi C10FCE2 compound miter saw is powered by a 15-amp motor provides soft and accurate miters in different materials including plywood, soft fiberboard, and hardwoods and even on aluminum sashes. That amount of power also allows this miter saw to be capable of even the toughest jobs. It the lightest and most portable among its class thus it is also convenient to use. This miter saw will allow you to adjust the bevels up to 45 degrees to the left. This is one versatile aspect of this miter saw as this will allow you make a variety of cuts for different wood applications. With the adjustable bevel, it provides increase accuracy and precision of cuts. This will especially be beneficial for a single project that will require different angles of cuts or for those who are doing several woodworks what will need a variety of it. 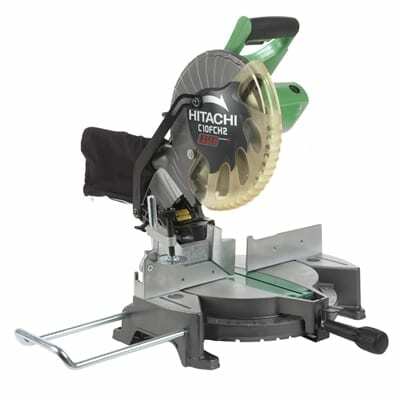 For ease of use, this 10-inch Hitachi C10FCE2 compound miter saw is built with a horizontal handle with vibration- reducing elastomer grip that will allow you to be in control of the grip the whole duration of use. It will make our hands feel comfortable while working even for a prolonged period. It also comes with a thumb actuated positive stop for fast miter adjustments. For added convenience, this miter saw comes with a dust bag to keep the cutline area clean and clear. It is powered by a 15-amp motor that allows it to be useful in all kinds of wood applications even those requiring heavy-duty and hard materials. This makes this miter saw a perfect aid for all woodworkers and professional carpenters who are commissioned to do use projects that may require variation of tasks. This miter saw is, therefore, a great power tool to use in making different precise cuts for different applications. It has great power and even convenient and comfortable to use. It is even lightweight, hence it will be easy for you to carry and transfer it when necessary. It can be ideal to use both in a professional and non-professional setting. This Dewalt model of miter saw is designed to provide you both with versatility and excellent accuracy to be used in different wood applications. It is also made to deliver quick and accurate bevel cuts of up to 45 degrees through dimensional lumber of up 2 x 8 inches. With a powerful motor of 15-amp and speed of 4,000 RPM makes it possible for this miter saw’s 12-inch blade to be used in any range of materials and projects, thus adds to its productivity and efficiency. Aside from the miter saw and blade, its package also comes with a blade wrench and a dust bag. It comes with different features that make it possible for this miter saw to deliver smooth and precise cuts. Its adjustable stainless steel miter detent plate provides you with 11 positive stops to increase the accuracy of various cuts. This is essential for any miter saw as this is one important basis for a good quality output. This miter saw is designed to be lightweight, thus easy to use and managed by any user. It also comes with a built-in carry handle thus makes it even easy and convenient to be moved and carried around at your workplace, be it within and outside your work area at home or in the job sites. It has an easy-to-adjust cam lock miter handle that will help make accurate cuts by adjusting the miter setting without the saw slipping into the miter detents. This miter saw will also allow you to set and make different bevel angles that can be useful in various jobs that measure between 0 degree and 48 degrees to the left and 0 degree and 3 degrees to the right. A miter saw with this kind of versatility will allow you to create various kinds of cuts, hence increasing its performance capacity and productivity. It comes with a four hardened steel bevel stops. Great tool with plenty of power, speed and increase in output, this miter saw is also convenient to use and operate, and portable thus can be moved around without any hassles. With all its added features, it can provide you precise and smooth cuts in any materials and in projects. Powered by the 15-amp motor and delivers 3,800 RPM, Dewalt DWS780 12-Inch Double Bevel Sliding Compound Miter Saw is a reliable power tool to provide you accurate cuts from the heaviest to most delicate tasks. It also features other components such as cam lock miter, detent override, bevel crown stops and a new handle design for added convenience and efficiency of use. This miter saw is specially designed to be durable and sturdy to endure long time and frequent use. With its compact frame and solid construction, it is built to withstand any rigorous work on the job sites with the miter saw’s rugged guards, precision-machined castings, fences, and bevel system and the tough stainless steel miter detent. Its dual bevel system is easy to use at work because it has a high-visibility scale and easy angle adjustment. It has a cam-lock miter button that will easily allow you to lock angles between detents. At the same time, a miter detent override is provided for accurate angle adjustment without falling into detents. It comes with a dust bag as well to keep all shavings and dust emitted by this miter saw in place. In this way, you will not be bothered to stop at the middle of your work to clean the cutline area and work surface. The 15-amp power motor that delivers 3,800 RPM makes this miter saw reliable to provide you productive results in a variety of applications. It makes it effective and efficient to use with an increased number of quality outputs. This miter saw will give you power, high performance and deliver quality and quantity of outputs. It is also versatile as it can provide you variety of outputs and can be used in a variety of applications. It can carry even the toughest jobs. It is easy to operate as well and durably made and built with its solid construction. Bosch GCM12SD 12-Inch Dual Bevel Glide Miter Saw will provide you smooth cuts, accurate performance and large cutting capacity that make it one of the best choices for its category. It has the exclusive Axial-Glide system that creates smooth cuts but saves you work space as it doesn’t use the traditional rail set up. It is quick and easy to operate and convenient to use as well. A power tool that has comfortable features will allow you prolonged use without getting easily weary of holding it. This miter saw is made with a soft-grip ambidextrous handle for its users to use with either their left or right hand. A combination of dust chute and vacuum adaptor is designed for your convenience in making sure your area is always clean and clear while working. With its high motor power and speed, it allows this miter saw to accommodate all kinds of wood applications, thereby increasing its efficiency and productivity. It has a 14-inch horizontal capacity, 6 ½-inch vertical capacities for materials against the fence or base, and 6 ½-inch nested crown-capacities against the fence at 45 degrees that allow it to make several cuts. It comes with two sliding integrated base extensions that provide adjustable support for materials up to 14 inches long. Its bevel capacity allows this miter saw to cut different angles in between 0 to 47 degrees. It can, therefore, provide you with any cuts needed for whatever task or project you are working on. In the same way, it can be used in any types of materials too. With its compact construction and solid frame, this miter saw is therefore mostly used in job sites to do heavy duty work and tasks. But thou heavy in weight because of its very durable composition, it can still be convenient to use. Homecraft H26-260L 10-Inch Compound Miter Saw has a motor power of 14-amp and 10-inch blade at 5,500 RPM that cuts woods like butter. It is especially ideal for any DIY projects at home. It is specially made to be lightweight thus makes it convenient to use and move around even on a daily basis. It comes with several features that make it easy and convenient to use. It is designed with an ergonomic handle for easy grip and maintains its smooth operation. This also helps increase efficiency and productivity of wok. It comes with a battery-operated laser as well to make sure you will have precise cuts by providing you with a clear view of the cutline. With its 14-amp motor and 10-inch blade, this miter saw provides you different sizes of cuts for your project. And combined with its other features, you are assured of a smooth finish and quality of output. This miter saw can make left bevel cuts from 0 to 47 degrees with denoted cuts of 0, 15, 22.5, 30, 45 degrees. It can also cut nominal 4x4 and 2x6 at 90 degrees and 2x6 at bevel setting with one pass. It works virtually with any miter saw stands. These features basically make this miter saw adjustable and flexible to use in any cuts and angles needed for any project. If you are non-professional or a beginner in a woodworking who needs a miter saw that is powerful and efficient enough to do any kind of job but convenient for home use, then this is perfect for you. It is also lightweight, hence easy to use and carried around. Most of them specifically like the overall performance of this miter saw as it definitely gave them the right and accurate cuts that they need in completing their projects. The features are also easy to use. One customer who is a beginner in terms of using power tools like this also appreciates the functionality of this miter saw and most importantly how easy and convenient it is to set up and operate that it definitely didn’t give him the hard time using it. The fact that it is lightweight and portable is a huge advantage as it makes it easy for them to move and transfer it, which in many instances would be necessary. However, there are some minor details that customers believe needs to improve. A few thinks that the instruction and manual that comes with the box is not clear enough to be easily understood. The dust bag is supposed to be a good feature but majority of its users actually thinks it is useless as it can only cover a small percentage of dust and shavings that come off while using this miter saw. Considering there are lots of choices available in the market for the best miter saw, here are other ten more alternative options for you to check and brief details about each of their features. Built with the largest crown molding cutting capacity (6-5/8”) in its class, this Makita LS1016L 10” Dual Slide Compound Miter Saw has a powerful 15-amp direct drive motor and delivers a 3,200 RPM to provide you precise cuts even on the toughest materials to any applications. It is equipped with a patented four –steel rail Sliding System that further increases firmness in producing the most superior cuts. It features four sliding fences with upper and lower adjustments for more precise miter and bevel cuts to accommodate a variety of cutting applications. Makita LS1040 10” Compound Miter Saw is engineered with high power and innovative technology ideal for a broad range of trades including finish carpenters, professional woodworkers, cabinet installers, flooring applications and general contractors. It is designed with a dual post compound pivot arm with bevel cuts up to 45 degrees to the left and miter adjustment ranges from 0 to 45 left and 0 to 52 degrees right with 9 positive miter stops for more accurate and smooth cuts. It even comes with an aluminum base to further ensure these precise cuts. It is designed with a soft-start technology as well for a smooth start up. Lightweight, portable and comes with a laser guide, this Craftsman 10” Single Bevel Sliding Compound Miter Saw gets the job done by providing you with precise and smooth cuts seamlessly even on thick materials. This miter saw is powered by a 15-amp motor that will deliver you high torque and speed. Spinning at 4800 revolutions per minute, it can cut any kind of wood consistently with any blade you attach. It normally uses smaller and easy to maintain blades as compared to other miter saws, yet not failing in comparison when it comes to performance and efficiency. Hitachi C12RSH2 Sliding compound miter saw is powered by a 15-amp motor that makes even the toughest material manageable and easy. It features the all new tall sliding fences that will help you make accurate cuts on these large materials. And with its adjustable tool-less laser marker, even beginners will not have a hard time making these perfect and precise cuts. It is designed with a vertical handle with soft, vibration reducing elastomer grip for your added comfort and control when using it. This Makita LS1216L Dual Side Compound Miter saw is recognized to deliver the largest crosscutting capacity in its class. Ideal for any heavy-duty, production and manufacturing settings and any job site use, it has a patented 4-steel rail riding system that will allow it to make the most superior and accurate cuts. It is engineered for cutting large materials line 4” x 16” beams and wide boards up to 15”. It is designed with an easy one-touch miter lock system for more precise adjustments and more efficiency. A built-in laser is also designed to help you see the cutline and work area clearly, thereby creating more precise cuts and increase your productivity. Certified refurbished, this Ryobi ZRTS1143L Miter Saw with Laser Green has a powerful 9-amp that will allow you to a variety of small cuts for different wood projects and applications. it comes with an exact line adjustable laser alignment system that will help you align the 7 ¼-inch carbide-tipped blade to the cut lines precisely., thus makes it easy and efficient for you when completing a task. It is designed with a horizontal D-handle for your added comfort and convenience. Its compact design and the innovative Axial-glide system provides smooth and precise cuts up to 10 inches in less workspace that other miter saw. by replacing the traditional sliding rail system with the hinged or articulating glide arm system, you will be able to work productively even in hallways, small spaces and area, thus maximizing space yet delivering smooth, precise and outstanding output. 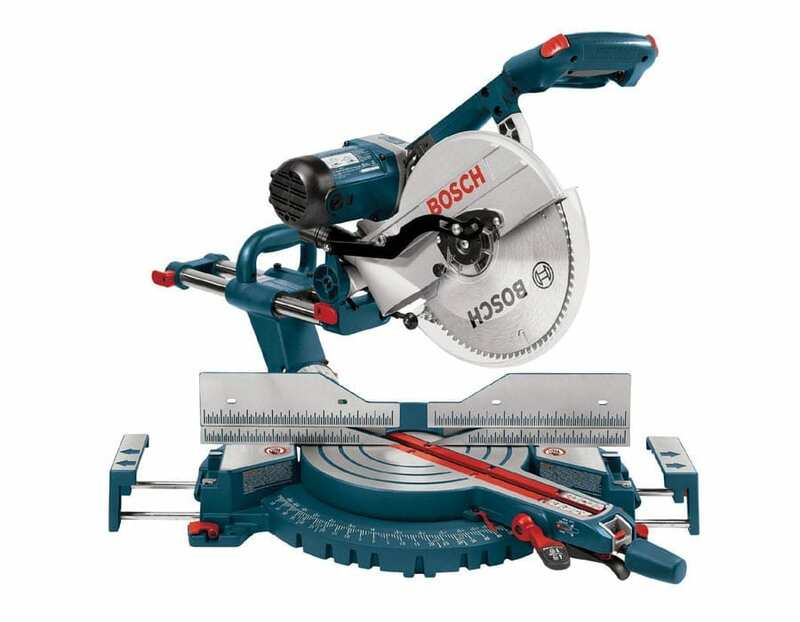 And with this Bosch CM10GD 10-Inch, Dual Bevel Glide Miter saw’s 15-amp power, 4000 RPM –motor with large and easy to read bevel and miter scales, performance is unparalleled and adjustments can be done quickly and accurately. With an oversized single lever bevel adjustment with nine (9) positive bevel stops, Milwaukee 6955-20 12-Inch Sliding Dual Bevel Miter saw allows you to make precise bevel cuts from 0-48 degrees from both left and right. Its motor is designed with a constant power technology which runs continuous speed under load. It also features a dual integral job site lights for both sides of the workpiece and cutline to provide convenience and ease in working making it easier for you to see the blade on the material. Ideal to use especially to beginners, this Skil 3317-01 10-Inch Compound Miter saw offers extra features such as the quick mount system that will help you mount the saw in three quick and easy steps, and the laser cutline guide with 9 positive stops for common miter angles that make cutting fast and accurate. It comes with a dust bag as well to keep your area clean and free of sawdust. Advanced electronics, dual laser guides, micro-bevel adjustments, quick-release fences, and easy-to-reference scales are the features of this Festool Kapex KS 120 Sliding Compound Miter Saw that will help you make precise cuts for any wood applications. It comes with a 60-tooth carbide blade used to cut woods, soft plastics, and other materials. The fine adjustment knob is used to control bevel angles in fractions of a degree, which has three settings: positive detents at 0 and -45 degrees, free movement between -45 and +45 degrees, and a free movement up to -/+ 47 degrees. Bevels can either be made to the left or right and the bevel gauge, however, appears on both sides of the saw. It is lightweight, hence it is convenient to use. Every project and tasks may need different angles and cuts of wood and at the same time may use a variety of materials to complete it. Thus getting a miter saw that can do these things precisely and correctly is essential for any wood work. Hitachi C10FCE2 15-AMP 10-Inch Single Bevel Compound Miter saw can provide you with these things hence makes it the best choice for me. It is powerful, versatile, efficient and convenient to use by any users and any jobs. The fact that it is lightweight is an additional point for me as well because it makes it easy and portable to use for any of my projects. If you want to check on this product, you may click here.